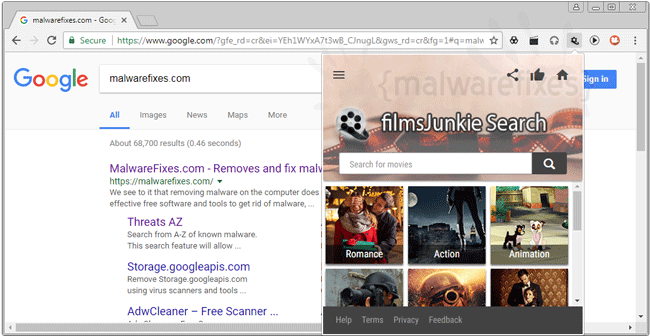 MoviesJunkie Start is a deemed as PUP or adware currently aiming to conquer Google Chrome browser. It is offered as an extension that can give better online search experience to users. MoviesJunkie Start also have other amazing tools like dedicated online search for your favorite movies, clips, actors, trailers, and more. In most instances, users are not aware on the installation of MoviesJunkie Start. It comes bundled to freeware or shareware that was downloaded from various dubious servers. Thus, be careful and take extra precaution when obtaining free software. As much as possible download your applications only from reputable websites. Once MoviesJunkie Start is running on the computer, it immediately changes some settings on the browser. 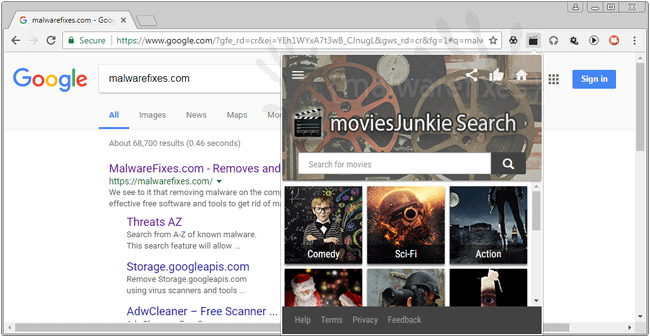 MoviesJunkie Start Extension integrates a bunch of features to Google Chrome. It can add toolbar, search tool, and couple of buttons and links that are attractive at first glance. Moreover, it replaces your homepage and new tab with MoviesJunkie Start search bar. Image below shows how your modified homepage and new tab will look like. We can assume that the main objective of MoviesJunkie Start is to gain online revenue. The program is free and will not cost user any money in having it. However, this adware has this intention of displaying countless advertisements on the browser. Ads by MoviesJunkie is the main source of profit and is highly anticipated by its developer. In addition, authors of this PUP aim to partially control ad display onto your browser. It will monitor your search queries and websites frequently visits. As you can see, MoviesJunkie Start is somehow a threat to your online privacy, thus, we highly suggest that you remove this thing from your browser. FilmsJunkie Search is another variant that asserts to be the same worthy extension that enhances online search experience when looking for online films and movies. Just like the threat on this topic, MoviesJunkie Search is just a re-branded version that offers the same features but unfortunately, it will be an annoyance once installed on the browser. 3. Look for and remove MoviesJunkie Start entry. If not present, look for any suspicious labels that was installed recently. 4. It searches for presence of harmful programs, plug-ins, add-ons, or any data that were found malicious and linked to MoviesJunkie Start. You need to Clean all items detected by this tool. After the previous scans, you may have deleted MoviesJunkie Start from the affected browser. This next step will ensure that no more module of adware will be left on the browser. This free tool scans and checks the browser for unwanted add-on and extension, and if found, Avast Browser Cleanup will give you a report and suggestion. 4. Avast Browser Cleanup will confirm before it permanently deletes the add-on. Please click Yes to proceed with the removal of MoviesJunkie Start on the affected browser. 3. On Extensions window, please delete MoviesJunkie Start by clicking on Remove or Trash icon. 4. Google Chrome will prompt for the confirmation of MoviesJunkie Start removal. Please click on Remove button to proceed. Resetting Google Chrome to default settings is helpful in deleting hard-to-remove extension such as from MoviesJunkie Start. This method is highly advisable to perform if you have difficulty in removing unwanted extension. This function will reset your home page, new tab page, search engine, and other areas affected by MoviesJunkie Start. Unwanted extensions will also be removed from the browser. This will not affect your bookmarks, history, and other saved data. You may also run Chrome Cleanup function from this page. An integrated tool from Google Chrome but with more advanced Adware scanner feature.